JS: Kelly, congratulations on your recent Zumbro 17 Mile Trail Race win and course record… you shaved about 12 minutes off of the previous course record and pulled (or got chased by) two other very talented women both going under previous record as well. Did you think that was in the cards for you? 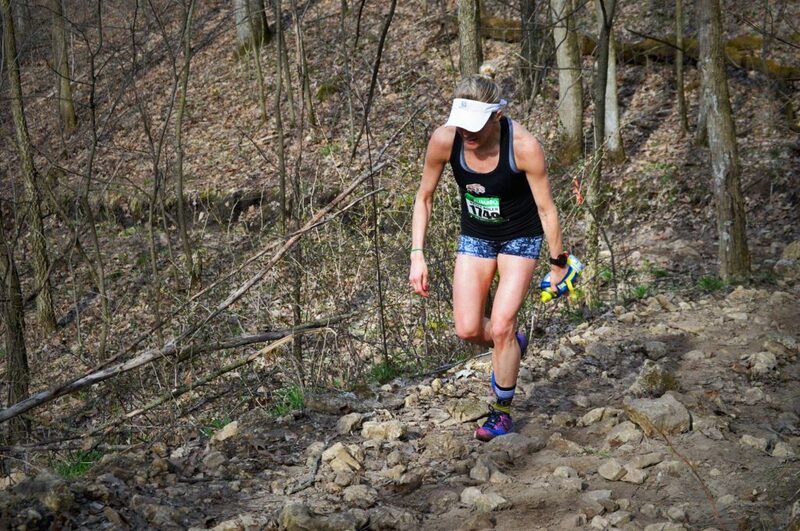 KB: I’d be lying if I said I didn’t look at previous course record just to see… But I rarely run trails and had never run the course, so I really didn’t know what to expect. That being said, I thought I found a dude at the start who was planning to run 2:25 (course) pace and thought I might as well try to hang within eyesight of him to give myself a chance at record. I lost him about halfway through and started feeling the effects of the sand & hills around mile 13 (aka BONK CITY!). Thought since I had been dropped & was fading that I was going to be way off 2:25, but fortunately I misheard the guy I pegged as my guideline. He ran 2:05, not 2:25, and I held it together just enough to come in under the record too. Awesome surprise! JS: How did the race unfold, were you ever running with the other women or mostly just mixing it up with the boys? you were in the top 10 overall of a very competitive field. KB: Although the second place woman ended up coming in fairly close behind me, I never saw another woman during the race. It was just me & the boys…and there were some FAST boys (in other words, they were gone from the start & I never saw them again)! And other than the first mile or so, there wasn’t a lot of movement in the race for me. I think one guy passed me & I passed two throughout the entirety. It was a pretty uneventful race when it came to strategy. JS: Anything else stick out for you from this years Zumbro race? KB: So much sand! Lol. I had been warned, casually, that there was sand, but I was not prepared for the duration and the squishiness of the sand. Also, the race organization is OUTSTANDING. The course is marked ridiculously well & the volunteers are awesome. JS: Although you have done well in adventure racing and have won all but maybe a one of the trail races you have entered, one could argue that your best running has been on the roads and I suspect that is where your heart is… are you getting closer to turning your focus to the trails or is there still unfinished business on the roads? Please feel free to share a little bit of your background with us. KB: Yes. I’ve been running since I was kid just chasing boys on the playground because it’s my passion. However unlike a lot of elite distance runners, I took a break from competitive running after college. I didn’t start really racing until about 2010, and throughout 2010-2012 I was totally doing my own thing & flying by the seat of my pants. On that, I was fortunate to qualify for the US Olympic Trials in the marathon (2012), and only because my friends realized I might have a shot. I had NO CLUE about that kind of stuff. After that experience, I decided to hire a coach and see what kind of potential I might have under an actual training program. Turned out to be pretty amazing. In 2013 I PR’ed (ran my fastest) in practically every distance from the mile (4:57 on an indoor track) to half marathon (1:11:33). Unfortunately I might have been pushing the envelop a bit too much and had to take almost a full year off from training to deal with illness & injury. But I just can’t seem to give it up! I’m now an “old dog” on the road circuit, most of my training partners & competitors are a decade younger than me, but I do feel like I have unfinished business and will try make one more cycle of the Olympic Trials marathon in 2020. The fun part this time around, is that I’m embracing stepping slightly outside the box of regular road training and trying to mix things up a bit. And while my trail running experience/training is really limited, I have a lot fun doing it. And even though I did adventure race (Google it) in the woods for a few years, it’s not at all like trail running. Adventure racing is literally IN THE WOODS. We don’t follow trails, so there’s a lot more run-hiking than true running. And we travel as a team, so you can only move as fast as your slowest teammate. JS: What else is on tap for you this year? I know you have run and won, one ultra, Trail Mix in 2011 (placing second overall), maybe a 50K? This year under a new coach (Eric Pooley with Dakota Distance Project), I’ll be racing a lot less and focusing more on quality training cycles. That being said, I’ll hop in a few road racing circuit races for my club (Twin Cities Track Club), and after getting second at the Afton 25k last year, I’d like a shot at redemption! Lol. But my main goal for the year will be an end of year marathon. I would be ECSTATIC to get an OTQ (Olympic Trials Qualifer, which for women is 2:45). JS: You are married to a (also very focused and intense) runner, trail runner, ultrarunner, Joe Boler – that must be pretty fun, what are the positives and negatives that come with that? KB: It’s wonderful! I’ve dated non-runners in the past and they were not always happy nor understanding about the time I invest in training. Joe totally gets it and in fact, is usually out rocking his own runs & workouts too. It’s also fantastic to have his perspective when I dabble on the trails. He has a ton of experience and gives me great tips on what to do (like carrying my own water at Zumbro which was KEY) and what not to do (don’t try run those giants hills). And even though I’m the first to admit I don’t always listen to his advice (like when he says to take more rest days), I sincerely appreciate his support & input. I can’t describe how great is it to have a partner in crime for the weekend adventures on the roads & trails! JS: You and Joe have three dogs – what is the limit to the number of dogs you would have at one time and a follow-up to that, why is Gus such a leg-licker? JS: Thanks Kelly! Here is to a great season on the roads (and maybe a trail or two)!